But I love Spring most of all because the temperature are milder and the weather much nicer… I get to spend more time outside, I get to run everyday…And with spring, I feel like eating even more lighter fare. Today, I was in the mood for more scallops annd since I had left-overs of fresh ginger and had a few citrus on hand, I decided to be try out a recipe I had seen on Cooks.com. I did change a few things as I did not like the tarteness of the sauce and wanted the sauce to be a bit sweeter. I like my version. I guess you will need to try it to decide if you like it…. Ingredients for 4 people: Juice of 1/2 lemon, Juice of 1/2 orange, 1/2 orange sliced and quartered. 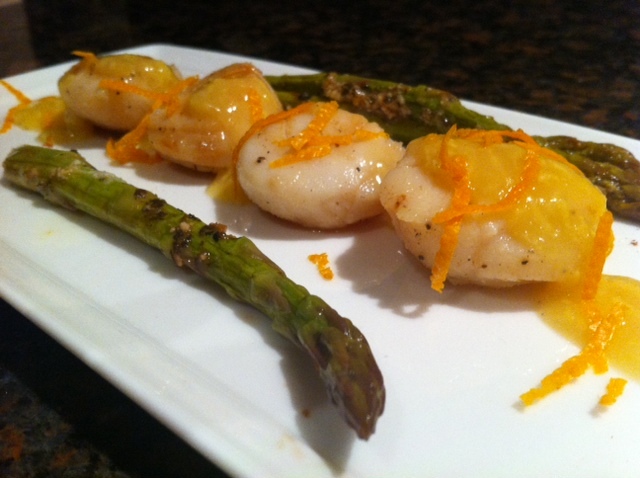 1 tsp of grated ginger root, 1 tsp of sesame oil, 1 tbsp of sugar, 1/4 tsp of cornstarch, 1/4 tsp of orange zest, fresh scallops 4-5 per person. 1 tbsp of butter, salt and pepper to taste. 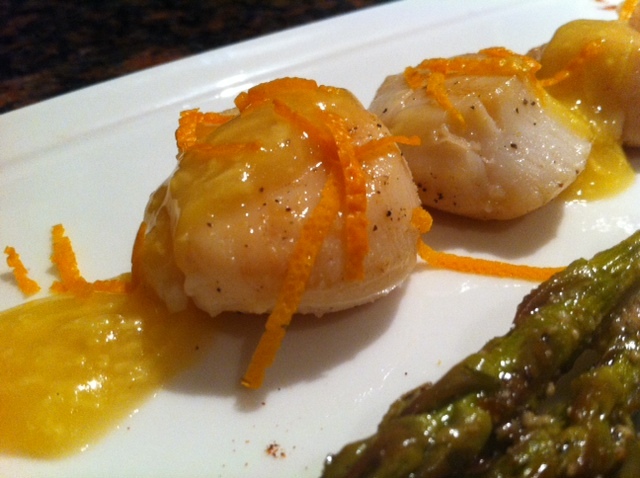 Melt the butter in a large frying pan, and when the butter is sizzling, cook the scallops ( about 1 minutes per side). Transfer to a bowl, cover with aluminium to keep warm. In a small sauce pan, stir together the juices, the sesame oil, the grated ginger, the sugar, the juice from the scallops( than is draining after cooking them), and the cornstarch. Bring the mixture to boil and cook for 2 minutes until the mixture thickens a bit. Add the quartered orange and stir to coat the orange pieces. To serve, either drizzle the sauce on the plate, and place the scallops on top, or lay your scallops and drizzle the sauce over the scallops. Sprinkle orange zest over the sauce for decoration, and to add more flavor. I added grilled asparagus to my dinner. YUMMM, it was good!! !